Now that I am starting to feel better I have started working on the family tree again. I’ve taken and found some interesting pictures lately. I’ll start with the Fullers. 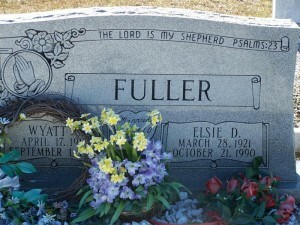 First is a picture of my grandparents tombstone. They are buried at Damascus Baptist Church in Leah Ga. 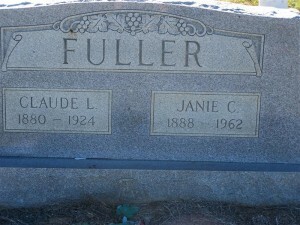 This is my great-grandfather Claude Lovelace Fuller and his wife Janie’s Tombstone. Claude died young due to an accident. This photo of Janie was taken around the turn of the century. 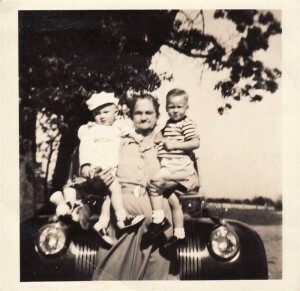 Janie was referred to as Nanie-mama by her grandchildren and as you can tell she was well loved. That’s my dad on the right. In Warren County at the Johnson Methodist Church is where the parents of Claude, William Taylor and Ella Fuller are buried. Finally we come to my great-great-great grandparents Francis Marion and Sarah Fuller. They are buried in Magnolia Cemetery in downtown Augusta. 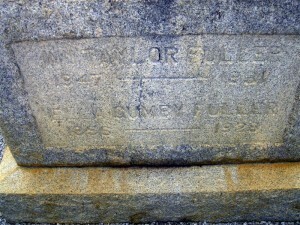 I only have 2 other tombstones to find in the Augusta area. 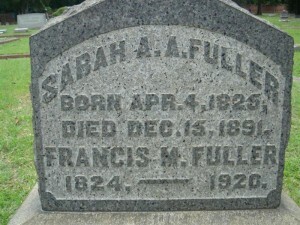 My 4th great grandfather Isham Fuller (1783-1864) died near Appling but I have no record of where his grave is located. 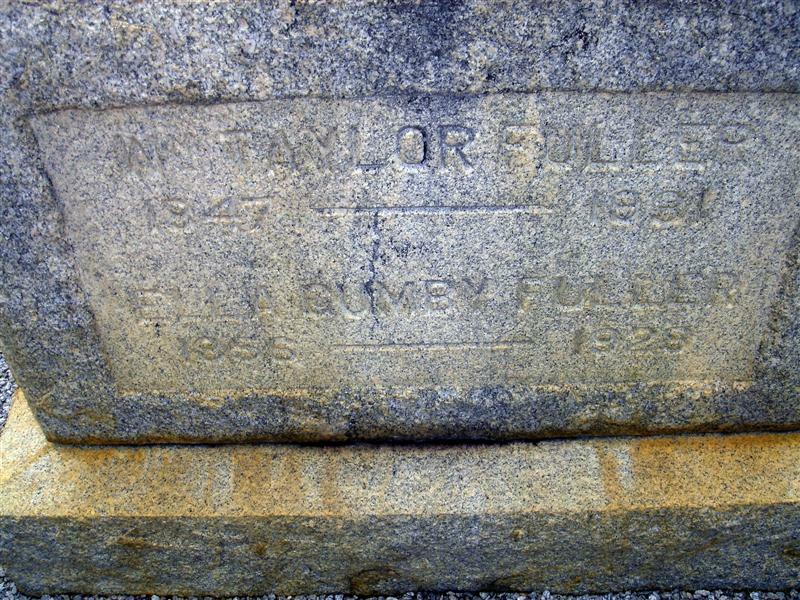 My 5th great grandfather Spivey Fuller (1757-1790) fought in the Revolutionary War and later moved to Augusta. He died and is buried somewhere in Richmond County. I haven’t found any record of his burial. On the Chamblin side of my family I have Wyatt Lucius Chamblin. 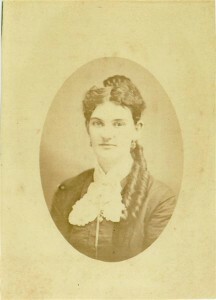 Wyatt is the father of Janie Fuller by his first wife Lou Eubank Chamblin (1861-1899). His father Wyatt Lucius Chamblin (1841-1897) was a Civil War veteran who lost his leg during the battle of Atlanta. I know he is buried in the old Bethel Church near Pollards Corner I just have to wait for cooler weather to get to it. His fathers name was Wyatt Chamblin and he was a doctor who moved from Spartanburg SC to Columbia County. Unfortunately I cannot find any records of his death. We may be related. 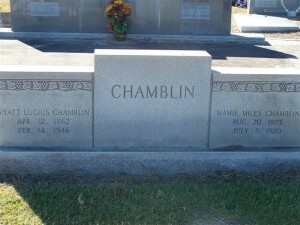 I am looking to start my family tree and my grandfather’s name is Wyatt Lucius Chamblin. who is in my family. I don’t remember hearing from you..
We are related. I had been emailing with your wife Peggy on Ancestry (I believe she is your wife), but we lost touch. My great grandmother (3x) is Jennie Chamblin (Dr. Wyatt Chamblin’s daughter – she is mulatto/colored). 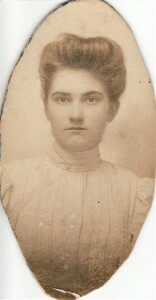 Jennie Chamblin married Griffin E Germany Feb 12 1890. They owned their land. They had four children Maola, Augustus and Griffin Jr., also James but he died young. Maola is my Great Grandmother – her daughter Rena, is my Grandmother. You can refer to the 1900 Census, as well as the Marriage License from 1890 for Jennie’s information. Our family church was/is in Grovetown, called WaterBranch Baptist Church. I would be happy to know more about the family history. Do you have a photo of Jennie? Do you know the name of the plantation Dr. Wyatt Chamblin owned during the Civil War or the name of their home? I have photos Griffin Germany and his sister Julia. Apparently the comments on this blog were borked and I wasn’t getting notifications. I have fixed the issue and would love to have more information on how we are related.